It’s not where I expected to move to take a job with a tech startup, but I’ve gotta tell you: I love St. Pete. One of the main reasons? I live a 10-minute walk from Tampa Bay. And I take advantage of it: You can catch me there at least three or four days a week, taking in a breathtaking, Lisa-Frank-colored sunrise. Well, me and my dog Odin. I got Odin about a year and a half ago, a week before the first (and only) Thanksgiving I spent in grad school. I’d only been in the program a month and a half, but it had become abundantly clear how ill-suited I was to both the program and the town. In rescuing Odin, I was also rescuing myself. So I was excited to discover Walk for a Dog, a Wooftrax app raising money for dog shelters and other animal-related charitable organizations — just by taking the morning walks Odin and I already cherish. Walk for a Dog is available for both Android and iPhone, and it’s simple and quick to get started. After you register, you can customize your dog’s profile and upload a picture of your pooch. Then, just tap the “start walking button” and get to wandering. Your smartphone’s GPS tracks your time and distance, and you earn money for your chosen organization! Best of all? Your proceeds go to a local charity. The app prompts you to choose your state and city, then populates a list of participating organizations. Fittingly, I chose Tampa Bay’s chapter of Greyhound Pets of America. You can walk even if you don’t have a dog — just choose to walk “with” Cassie, CEO Doug Hexter’s rescue mutt. Walk with Cassie! Also pictured: my inability to type Odin’s name before 7 a.m.
Once your walk is complete, you’re rewarded by the sponsors behind those donations you’re racking up. Provide an email address, and you’ll get coupons and freebies delivered right to your inbox. It doesn’t matter how long your walk is or where you go — but you do need to log on and walk at least once a week to remain an active walker. Your organization of choice gets paid depending on how many active walkers have chosen it as their beneficiary. So get your friends in on it to really make an impact! Whether or not you’re an animal lover, this app is a sweet and easy way to do some good — without spending any actual money! Plus, the app could get you started with a new, healthy activity — and what better motivation to get walking than cute, happy puppies? 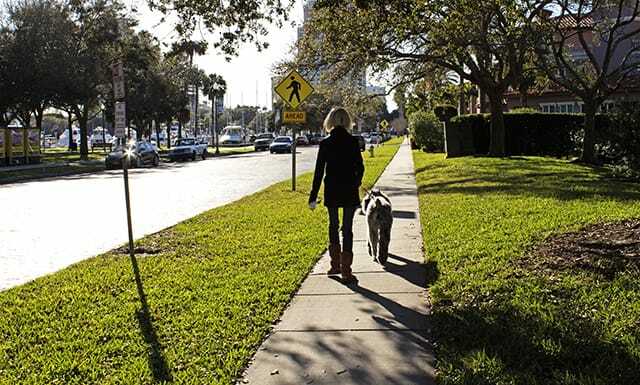 Your Turn: Will you use Walk for a Dog to start raising money for animal shelters? Jamie Cattanach (@jamiecattanach) is a staff writer at The Penny Hoarder. She also writes other stuff, like wine reviews and poems. Odin is a big, floppy dog whose favorite things in life are cuddles, couches and peanut butter. In that order.